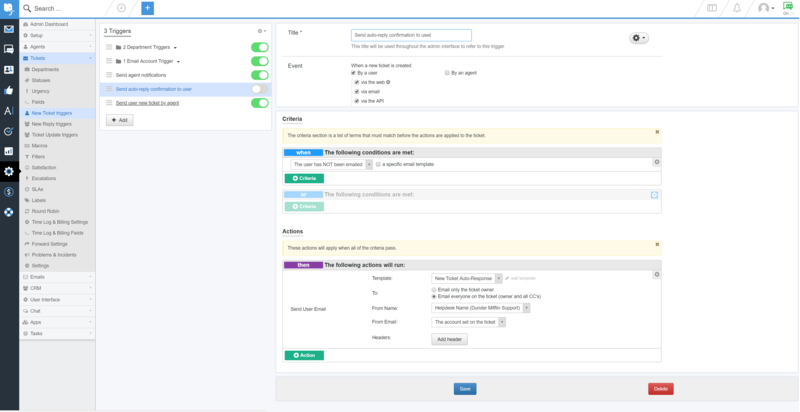 Deskpro customers often tell us that one of their all-time favourite features is Triggers, which automatically run predefined actions in response to ticket events. Triggers make setting up complex workflows a piece of cake, and enable you to automate routine and mundane tasks. This makes life easier for you, your teams, and your users. There are a few built-in Triggers that control basic helpdesk functions. In fact, the mechanism you used to link email accounts to helpdesk Departments is a Trigger. Triggers can run in response to a new ticket being created, a new reply to an existing ticket, or a when a ticket’s properties change. Trigger actions can include almost anything. For example, changing the properties of a ticket, or sending an auto-reply email to a user when they submit a new ticket. In fact, let’s try taking a look at that Trigger now so you can get a feel for how the feature works. Go to Admin > Tickets > New Ticket Triggers. Click the Trigger titled Send auto-reply confirmation to user. You will be able to see the Events that will cause the Trigger to run, and additional Criteria that need to be met in order for it to run. If the Criteria are met, the Event will cause the Trigger to run the defined Actions. You can choose to enable this Trigger by clicking the grey button in the list of Triggers, or you can experiment and create your own. For more information on using triggers to automate helpdesk processes, refer to our guide. Or read the next article in the 'Getting Started' series on managing and replying to tickets.